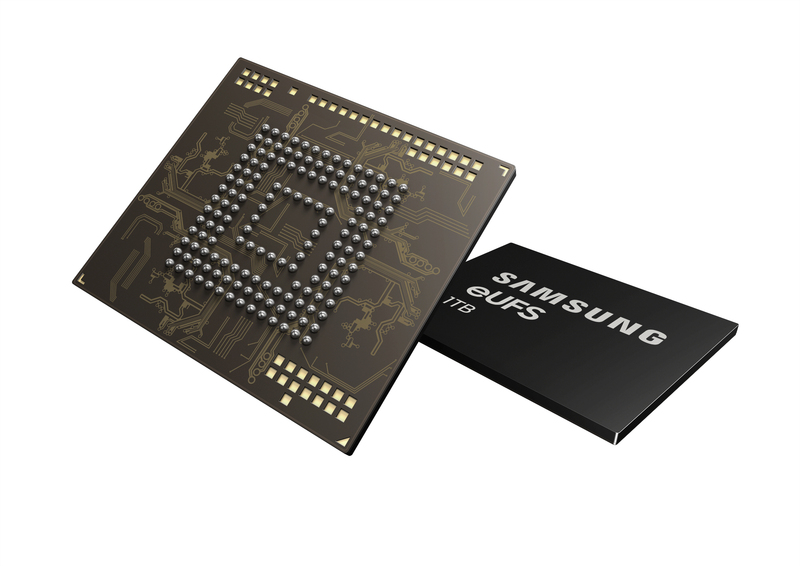 Samsung says it has begun mass producing the industry’s first one-terabyte embedded Universal Flash Storage (eUFS) 2.1, for use in mobile applications. The 1TB eUFS doubles the capacity of the previous 512GB version within the same package size (11.5mm x 13.0mm) by combining 16 stacked layers of 512-gigabit (Gb) V-NAND flash memory and a proprietary controller, says Samsung. Smartphone users will now be able to store 260 ten-minute videos in 4K UHD (3840×2160) format, whereas the 64GB eUFS widely used in many current high-end smartphones is capable of storing 13 videos of the same size. 5GB-sized full HD videos can be offloaded to an NVMe SSD in as fast as five seconds, which is ten times the speed of a typical microSD card, says Samsung. In a statement, Samsung said the company plans to expand the production of its fifth-generation 512Gb V-NAND at its Pyeongtaek plant in Korea throughout the first half of 2019 to launch the 1TB eUFS.